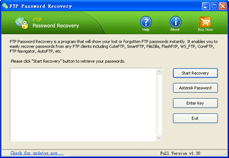 FTP Password Recovery is a program to recover logins and passwords for all FTP accounts stored by FTP client software. It's very easy to use and works with CuteFTP, SmartFTP, FileZilla, FlashFXP, WS_FTP, CoreFTP, FTP Control, FTP Navigator, FTP Voyager, WebDrive, SecureFX, AutoFTP, 32bit FTP, BulletProof FTP, Far Manager, etc. All passwords are recovered instantly. * Recover passwords stored by CuteFTP, SmartFTP, FileZilla, FlashFXP, WS_FTP, CoreFTP, FTP Control, FTP Navigator, FTP Voyager, WebDrive, SecureFX and AutoFTP, 32bit FTP, BulletProof FTP, Far Manager. * Recover forgotten, lost or saved passwords to all FTP accounts.